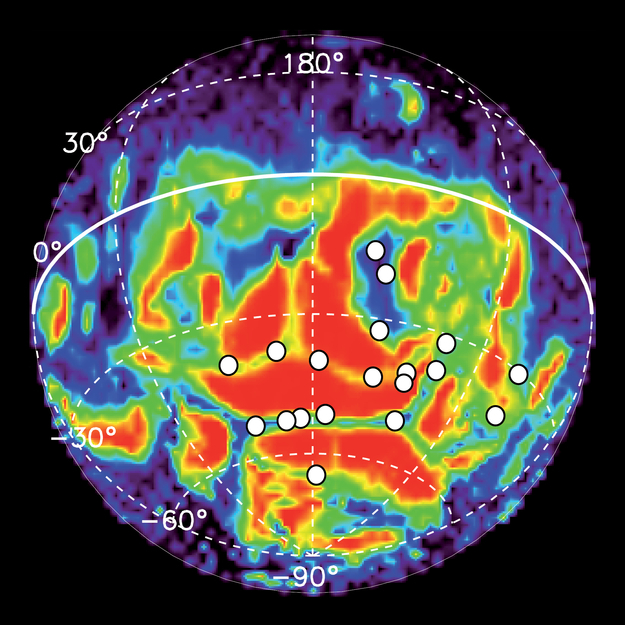 Locations of 19 auroral detections (white circles) made by the SPICAM instrument on Mars Express during 113 nightside orbits between 2004 and 2014, over locations already known to be associated with residual crustal magnetism. The data is superimposed on the magnetic field line structure (from NASA's Mars Global Surveyor) where red indicates closed magnetic field lines, grading through yellow, green and blue to open field lines in purple. The auroral emissions are very short-lived, they are not seen to repeat in the same locations, and only occur near the boundary between open and closed magnetic field lines.